Sadly, sometimes my attempt to uncover information about a long-lost brand just simply reaches a dead end, before it’s even started. Point in case – is this packaged cheese brand. Someone was selling a box on-line a few weeks ago and I have faithfully recreated the carton design as best I can from the blurry snap. I estimate it’s from the late 1940s to late 1950s but it looks like this brand was around for a long time – let’s face it – people starting new brands in that era wouldn’t exactly consider two extinct birds a state-of-the-art product push. My best source ended up being an early book by Kiwiana impressario Richard Wolfe, “Well-Made NZ: A Century of Trademarks” published in 1987. I have to say that, while it is inconveniently denoted into grouped themes, and with no real index, or order either numeric or alphabetical to go by – it’s actually turned out to be a damn good resource over the years; and this is my second purchase of the same book. 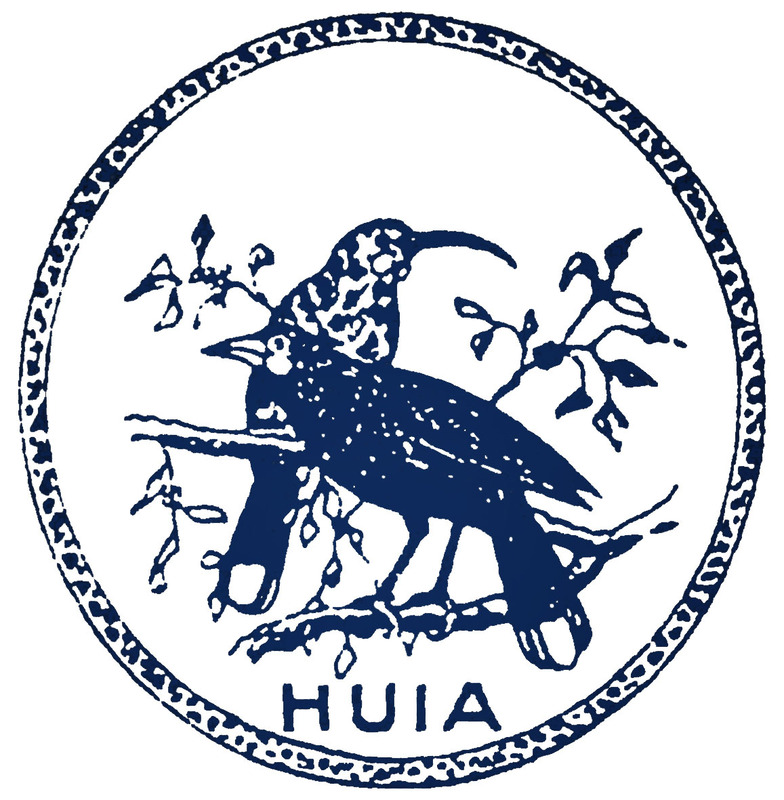 Anyway, this tome told me that the only Huia brand (there were many) that was manufacturing dairy product was The Co-operative Dairy Company of Otago Ltd, Castle Street in Dunedin, and dates the logo to 1926. The first dairy co-operative was established in Otago in 1871. By 1920, there were 600 dairy processing factories throughout New Zealand of which about 85% were owned co-operatively. the NZ Truth, 13 December 1924 discusses the company in an article quite sarcastic of tone entitled “IS THIS CO-OPERATION OR CAPITALISM?” Well, excuse me. Fred Waite, (1885–1952, farmer, politician, and historian) was behind the formation of the Co-op and since he really didn’t take up dairying until returning from service around 1918, it cannot have existed before then, which cuts it down to around 8 years or less before it is sold off. I found a registered trademark at the NZ Intellectual Property Office, but like all in their database, it does not give years unfortunately. It is listed under the actual company name first with no trademark, as “revoked “; and then the below logo (I guessed dated mid to late 1920s , I wasn’t far off), as “expired” under Goodman Fielder New Zealand Limited. It seems they still own the rights and it sits idle. Just previous to WWII saw rise in popularity of a recent phenomenon – DIY shopping – in chains like Star Stores, Self Help , and Four Square to name some of the few. I can imagine after the war, with rationing restrictions loosened and an exploding demand for new products, GF took their humble Co-op purchase out of its tin milk cans and greasy paper – turning the brand commercial with processed convenience foods such as this foil wrapped flavoured sandwich spread. 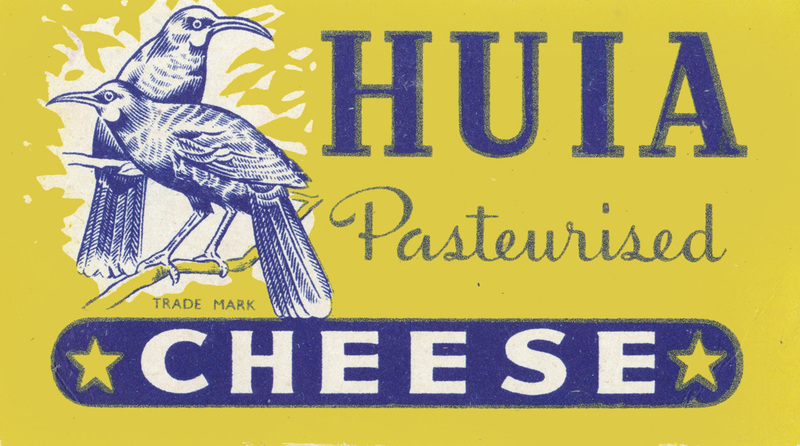 The Alexander Turnbull Library has a butter packaging collection, which contains a Huia wrapper dated 1970-1971 which reads “Huia pure creamery butter. The Co-operative Dairy Co. of Otago Ltd, Dunedin. 1 lb. nett. 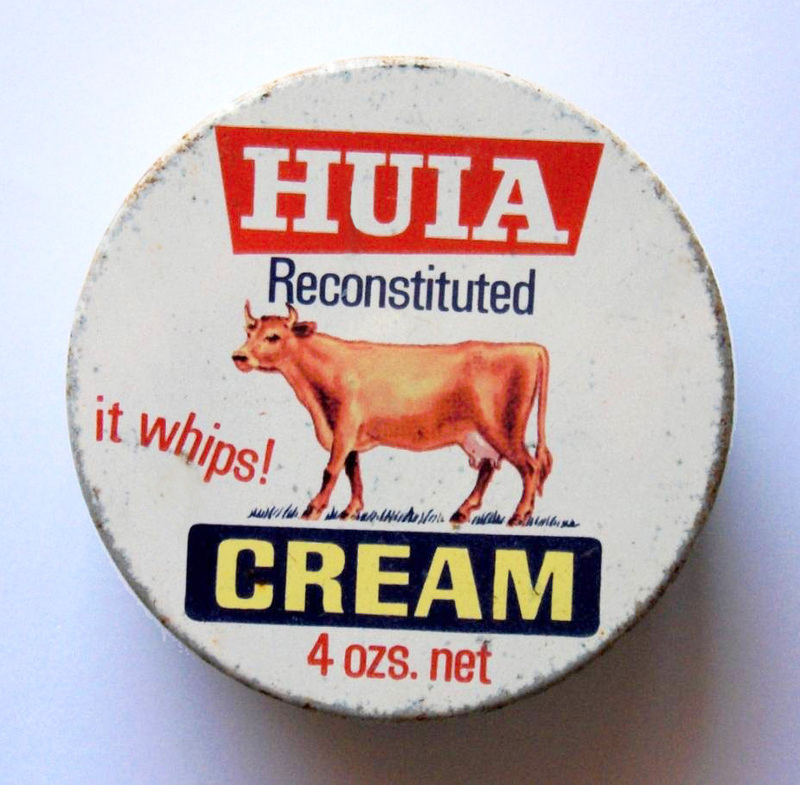 Also ask for Huia reconstituted cream; it whips – packed in 4 oz & 8 oz tins.” It’s great an accurate date is provided, but without more of them, it’s hard to figure out the story of what happened to this brand as it was clearly passed from one owner to the next – as companies merged and changed hands on a more corporate level. GF rivals Fonterra for its trading and decimation of brands making it nearly impossible to unravel some of these stories. And that is all. Apart from this – In an interesting turn of events that make a full circle of the brand and history – The Hocken Library and Archives is now housed in the old Otago Co-operative Dairy Company building on Anzac Avenue, North Dunedin after an 8 million dollar refurbishment recently. 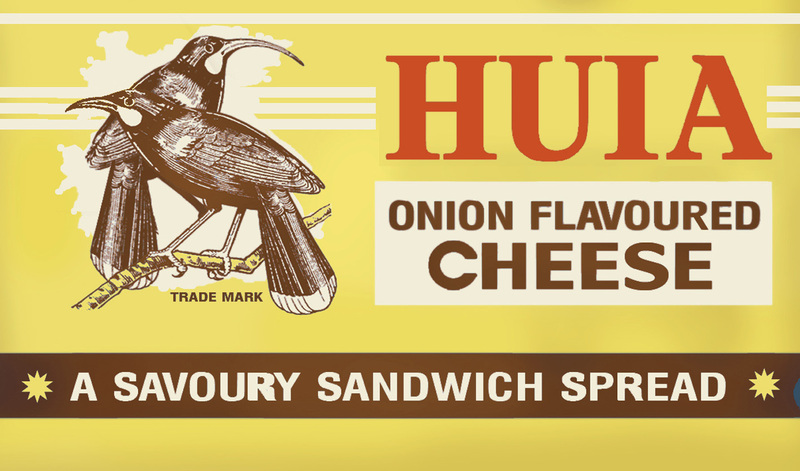 Addendum, early May 2014: Since publishing this short article way back when – I’ve come into a few items regarding Huia cheese, which are posted below. It seems that the packaging had changed around 1960, as evidenced by the adverts below which show a different design in use. So I stand by my estimation of the date I quote above. The packet I originally posted would be from the 1950s – more the later end. I made several mistakes with the packaging as well as the article (early days!) as noted in the comments section by a number of people. It is, in retrospect, a pretty poor effort with the focus on my recreation work. I am pretty thorough these days, and so usually things are fairly accurate (although people just love to tell you when you have messed it up). However, as far as I recall the information came from a variety of articles on Papers Past and as such contemporary reportage is more accurate than “retelling” by anyone. That said, I am not really interested in backtracking and completely re-writing/researching this piece all over again because I know what I am like, I will read hundreds of articles and leave no stone unturned until I get the full story – a big job – and the idea is just tiresome right now. We will just have to put it down to being a not very good attempt due to lack of experience at that time and move on. 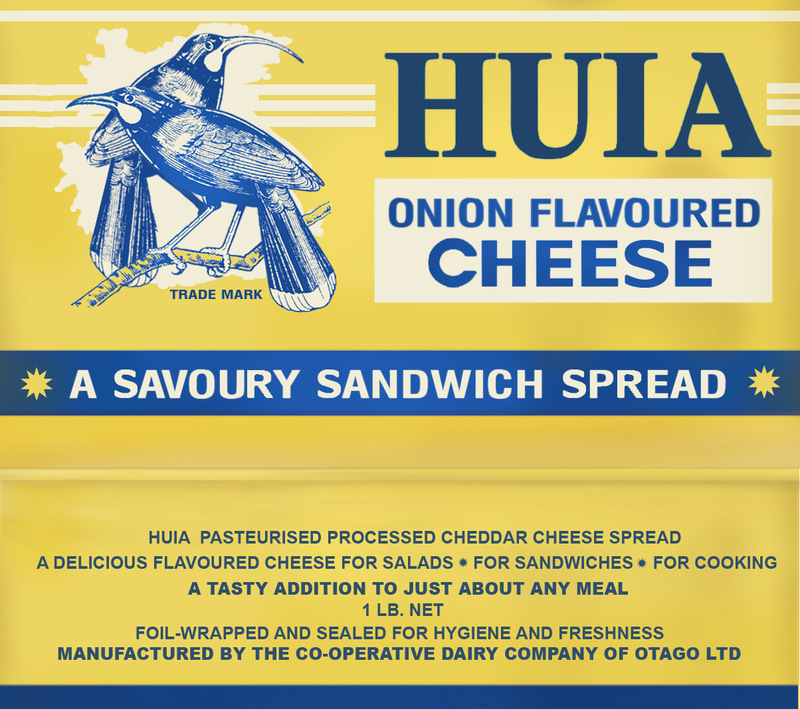 One important thing to note, which made it confusing to date the original box I posted at the top of the article is – that Goodman Fielder didn’t acquire the rights to Huia probably until some time in the 1980s. 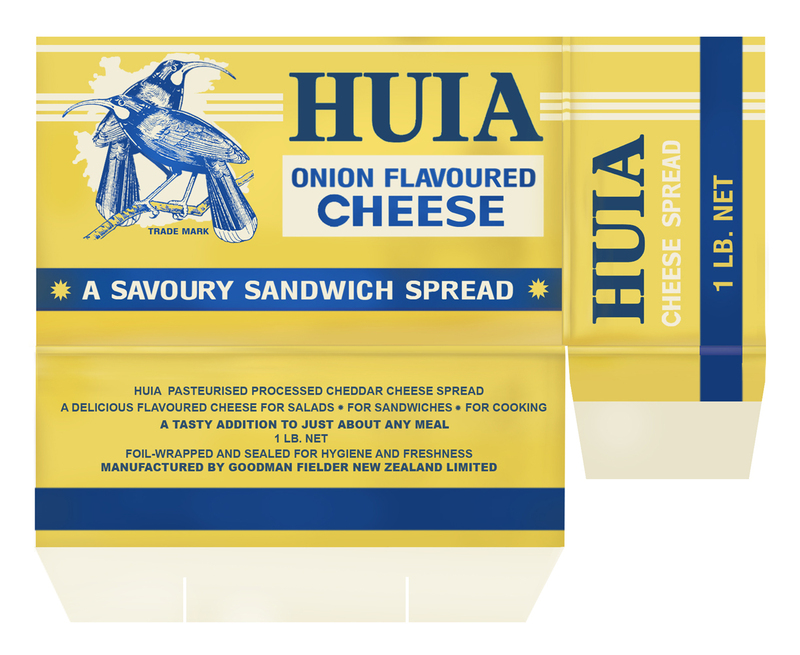 Occasionally I have to go out on a limb to fill in details when I recreate designs, and since both the Huia logos I have were registered to GF, I put their name on the box. This was wrong, very wrong. All were honest mistakes, I swear. Some adjustments to the box I originally posted – now with a male Huia at front instead of two females – the latter always have long, arched beaks. I’ve also corrected the company name. The Founders Heritage Park in Nelson has this red and brown version of the same box I originally posted, in their their ol’ timey general store display. This one circa mid-late 1950s. I have no idea why they produced the exact same product in a different colour variation box. The only thing I can think of is the colours were revised as a step towards the more modern look of the next design which had red in it. Perhaps at this point the long-running blue and yellow seemed a bit old-fashioned. 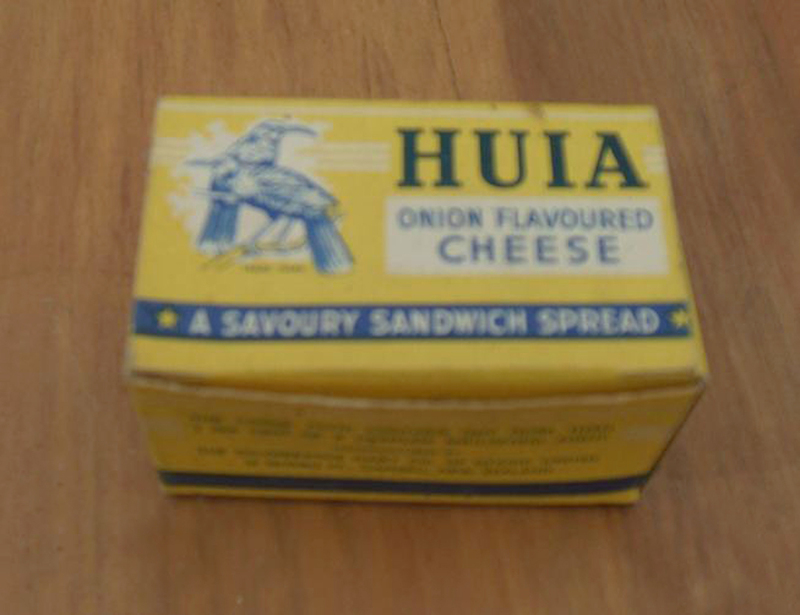 A Huia pasteurised cheese box top, likely early 1950s. Image courtesy of Mike Davidson collection. This was in a large collection of packaging items dating from the late 1940s through to the early 1970s – but the bulk was compiled between the early 1950s and early 1960s. 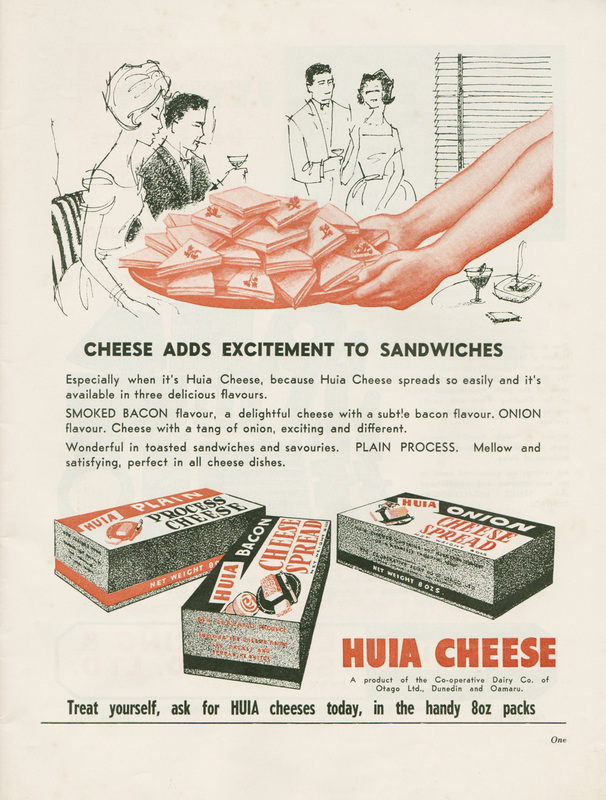 Huia Cheese Spread advert, Festival Time magazine, 1962. Image courtesy of Owain Morris Collection. 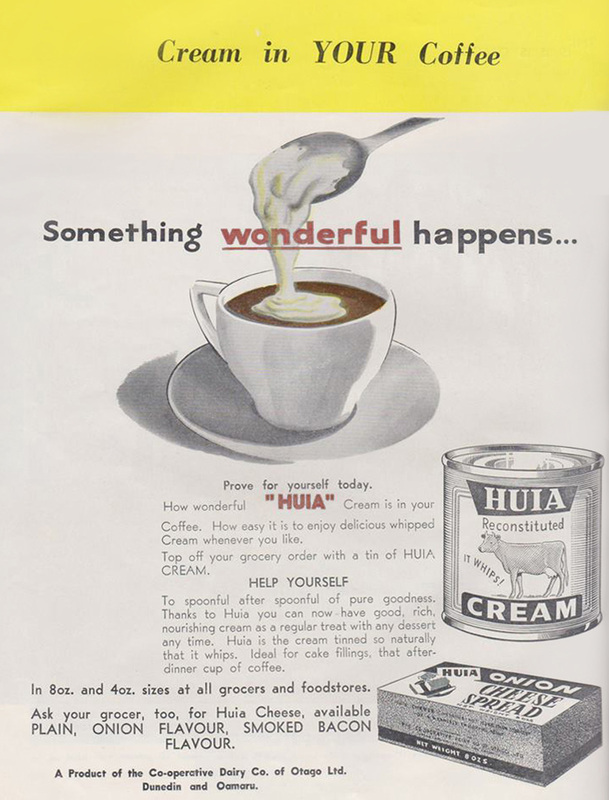 Huia canned cream and cheese spread advert, unknown Dunedin magazine, 1960. Note the new box design present – nowhere near as attractive as the old one. Image courtesy of Owain Morris Collection. 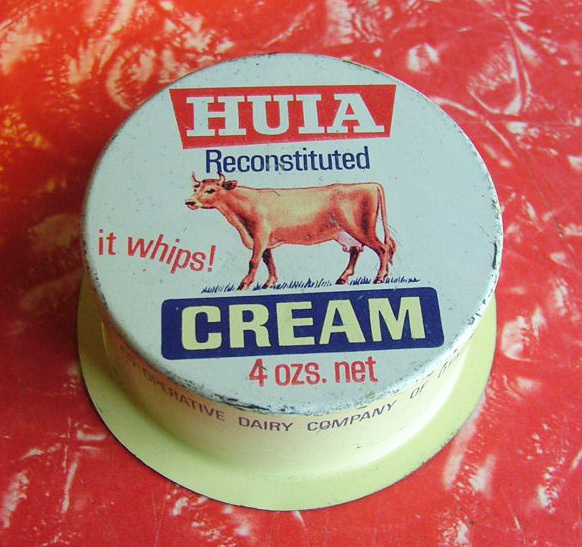 Addendum, late Oct 2015: The above Huia canned cream lid, probably dates from the 1960s. I don’t quite understand how these tins worked; as you see in the early 1960s ad previous, the cream came in a regular machine-sealed, perfectly hygienic can the same as any other product. However later they seemingly changed to this design in which a close-fitting cap slipped over a tin base, seemingly not permanently sealed. Provenance of above image unknown. The below image shows that further to this at some time the tin had a weird flared lip added (I think the correct description is the unfortunate term ‘flange’) which doesn’t shed any light on how it either opened, let alone stayed shut with perishable liquid in it. Go figure. Maybe someone here can enlighten us on this contraption. This image courtesy of Graeme aka thegrayman at The Oddity, Waikouaiti.